If you’ve ever wanted to try out Linux and you’re a PC user. Now you can and you don’t even have to worry about destroying your Windows installation and the best part of it is that you don’t even have to set up a separate partition for it. There are no longer any excuses for not trying Linux out. Ubuntu Linux, that is. Wubi is a very simple application. You run the application and you give it your preferred username and password. 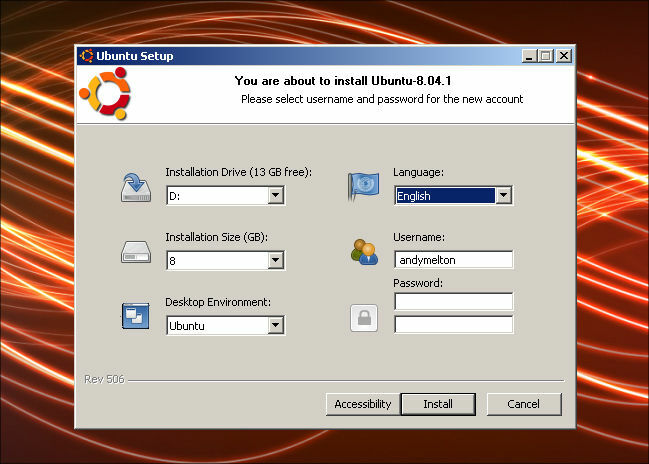 You can change advanced options such as where you want to have Ubuntu installed, which version of Ubuntu Linux you want to use (standard Ubuntu, Kubuntu, Xubuntu or Ubuntu Studio). Once you complete the two step wizard the program will download the version you chose. You’ll then have to reboot and choose Ubuntu from the operating system list. Ubuntu will then be installed into a directory on your computer inside of your Windows installation. Once Ubuntu is installed you’ll reboot and choose Ubuntu from the list again, then login to your newly installed Ubuntu Linux desktop. Once you are finished using Ubuntu you can simply reboot your system and choose Windows from the list, which is selected by default. So remember when you reboot you have to choose Ubuntu from the list if you want to get back into it. 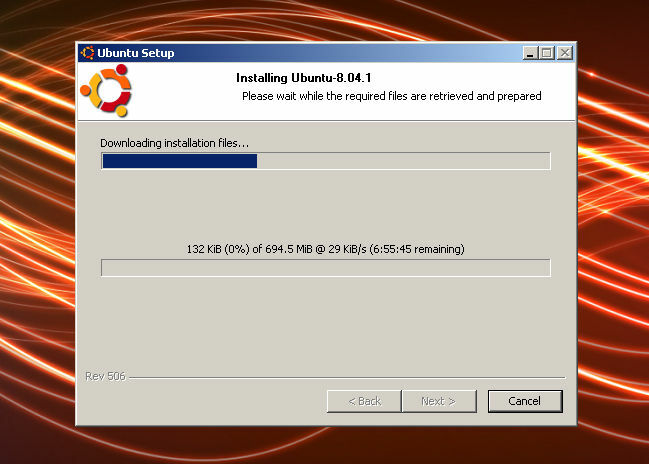 The great thing about Wubi installing Ubuntu Linux is the fact that it is a really good distribution, especially for people who are more familiar with Windows. With Ubuntu Linux you’ll still have access to the files on your computer by going to Places >> Computer and double clicking on the drive where your files are located. Also, if you have a good graphics card in your system you can take advantage of it by going ahead and allowing the restricted drivers to be installed onto your system. Don’t worry, in this case restricted means that there are copyrights on some of the drivers and they can’t be used in some countries. Also, I don’t think Ubuntu will support these. However, by using the restricted drivers I was able to enable the desktop effects and put some really awesome eye candy onto my Ubuntu Linux desktop: wobbly windows, virtual desktops that spin on a cube, fancy menu effects, etc. If you’d like to see some of these effects, check out this video I found on YouTube. If you get tired of having Ubuntu Linux installed you simply reboot into Windows and un-install it like any other application. Although I think Ubuntu Linux is a great distribution, I still prefer Fedora because that is what I am most familiar with. I would like to see the Wubi project expand. 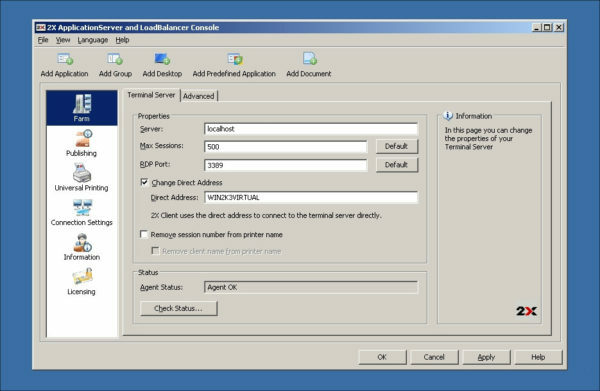 Maybe they could offer an API for other Linux distribution vendor’s to create an installer for their specific Linux distribution. A suggestion to the developers that I would make is instead of having users click on “Advanced Settings” to make advanced changes such as where you want Linux installed, make it a part of the wizard. My first time going through the wizard, I did not notice it. Also, one thing that annoyed me was the fact that as Ubuntu Linux downloaded with the Wubi installer program, three pressed copies of Ubuntu 7.04 (Feisty Fawn) were sitting right beside me. It would be good if you could choose to either download the ISO image, allow you to insert your disc into the drive and create an ISO image or to select an ISO image that you may have already downloaded. The only reason that I can think of as to why they would force you to download a copy of Ubuntu is that it is a custom version with a specific installer. Like I said earlier, if you’ve been wanting to try out Linux, here is your extremely easy option for getting Linux up and running very quickly. Article update: Thursday, September 11, 2008: I have updated the screenshots for this article so that they look nice with the new TechButter theme. Unfortunately, I was unable to download the version of Wubi I wrote about in this article. 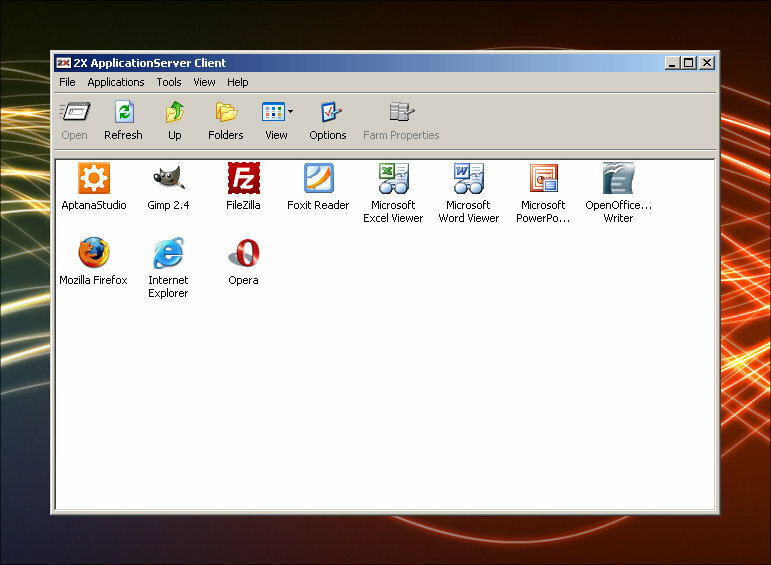 The article talks about Wubi for Ubuntu 7.04 and the screenshots are for Wubi Ubuntu 8.04. The software looks the same. The only difference is that there is no longer a wizard. All of the options are on one page. When you click “Next” wubi begins downloading the Ubuntu installer. In looking for the original version of Wubi I found out that there is a project that is currently in the planning stages that will allow you to install any Linux distribution you choose. The project is called WubiX. Hopefully the project will be out of the planning stage and into production soon. I just downloaded and installed IE7. A MUCH, MUCH needed update to Microsoft's web browser. The installation went very well, there weren't any glitches, it done everything on its own without asking many questions. It is interesting because in older versions of IE, 4 & 5, it would ask you all kinds of questions. Whether you wanted this option or this plugin, etc. I think one of the reasons they done that with the older versions was because they were trying to add more functionality to the operating system. I remember getting web view folders with IE4 and being tickled to death because I was using Windows 95 at the time and it looked like a lot of the features that 98 had. However, they don't need those options now since the only operating systems that can install this version of IE (2000, XP, Server 2003, Vista) have those features built into the OS already. Upon installing and rebooting the computer I opened up the new version and waited for the run-once website to appear, it never did, it gave a message stating that this website could not be found. This wouldn't be good for a new computer user, they might think that their browser is broken, however, I do realize that Microsoft's servers are probably under a lot of stress from everyone downloading, installing and running the new version, just as I did. I decided to navigate to my website to see how it rendered. As a web designer I have been anxiously awaiting this version of Internet Explorer because supposedly, I won't have to hack my code anymore to make it work! The rate of adoption will probably be slow and I honestly cannot wait until Microsoft sends it out as a Windows Update. I realize there will be companies that cannot update to this version due to internal applications, but, for everyday users, it will be nice not to have to hear them complaining that my website does not render correctly in their browser because Microsoft refuses to comply with web standards! I am anxiously awaiting to see if this new version is more standards friendly. I navigated around to a few pages on my website. The navigation menu still does not appear as it does in Mozilla Firefox and Opera. I also clicked over to my Flickr photo sets page and the sets have a gap in them about four rows down. When I did navigate to my website I got a pop up message about setting up my phishing filter. I'm sure that this is just a standard dialog meant to appear when you access your first website. Hopefully someone hasn't hijacked my website and is installing spyware onto my visitor’s computers! I do think this will be a great addition to the IE browser for those people who have just purchased a new computer and are learning to use the Internet because they don't know about all these security risks, spyware, etc. I do appreciate the minimalist layout that they have went with in IE7. I suppose this will give room for those spyware toolbars that everyone seems to get. I don't think that they made it apparent enough that the browser now supports tabs. However, I do have to give them credit because by default Firefox does not even add the “New Tab” button to the toolbar. I really do like the quick tabs feature. If you have multiple tabs open you can quickly view all the open tabs and select the one you want to view. I think they will really entice a lot of users with that feature because users will see the true benefits of tabbed browsing by using them. They have added an RSS reader into the browser. This will also be another great feature for those casual computer users who don't know anything about RSS. They will know that when they see the orange button light up, they can subscribe to that website and then not actually have to go back to that website to see if there are any updates. One problem with this is that after I had subscribed to a few of my own personal feeds, I did not see how I could pull up the RSS Reader with all of my subscribed feeds. I'm still looking for it. The only way I've been able to get back to subscribed feeds is by going to one of my blogs, looking at the feed and then viewing the subscribed feeds. I think they have really done a lot to bring IE up to speed. I think it is a serious competitor to the other browsers. The problem is that a lot of the new features that are in the new version have been in other browsers for several years now. One feature that I see being a killer feature is the anti-phishing technology. It is one thing for Firefox to block pop ups and to block software from being installed on your computer, but, its another thing to be fooled by a website that looks real and is actually a fake. I think that if Microsoft were to create versions of IE7 that would run on the Mac & on Linux then they would have a lot more users. The problem is, Microsoft is no longer creating a version to run on the Mac and I would SINCERELY doubt that they would create versions to run on Linux, although, I wish they would! For the new users out there, I think they should have included a “Whats New” guide when the new version launched that gives a guided tour of tabs, phishing, etc. I don't think they've made these features stand out enough. I also don't think that the users will navigate to Microsoft's website to read about them. I really wish more users could understand the true benefits of RSS. Lastly, I think this is definitely a much needed update to IE and I believe if there is anyone out there running an old version of Internet Explorer and can upgrade to this new version I would highly recommend it. Mainly because of the advanced security but also because of the new features the browser has. I think that many, many people would benefit from using RSS feeds, but most people either don't know they exist or have no clue how to use them. The only reasons I'll be using IE7 is to check and make sure my websites load properly in it and to access those websites that only work with IE. I don't think I'll be ditching Firefox anytime soon, I'm too happy with it. However, with that said, I strongly urge anyone who uses IE as their default browser to update to this new version.